It is the age of instant—and constant—editing. To see oneself in print that is but a phantom on the Web. I SIT ON MY BED AND GAZE wistfully at my newly acquired desktop computer: the aura it creates is unmistakable. The room suddenly takes on the cool, electric ambience of a corporate office. The computer's beige and grayish-white exterior seems almost too clinical, too sanitized. When I turn it on, it is relatively quiet, with only the regular mouse click and constant but soft whirr of the fan in the CPU tower breaking the silence. And of course the gentle, pecking sound of the keyboard. Ideal for the urban tropics, where there is already too much noise in the air—at times a din that seldom lets up. In my eagerness, I anticipate great things from this machine: the hierarchies of its intricate digital operating systems ensure that the results will be huge, and the effort on my part, minuscule. But the choices will be numerous, the decisions agonizing. The Mouse will be my trusted companion, putting everything just a finger-click away. And WINDOWS? The endless routines and subroutines that appear as windows on the screen, one window opening out onto other windows successively, that can then be telescoped back into the observer’s world which represents the status quo; a great metaphor for looking out onto other worlds, exploring, branching out, discovering new possibilities, and finally breaking free of tradition. Need I ask for more ? Or will our fascination with the possibilities end in disappointment ? Yet a question nags at the back of my mind. In this age of cyberspace, the medium and the means assume greater and greater importance in our lives. Content takes a back seat; as though it is the medium that somehow gives the content its meaning. Moreover, the mere consumption of information plays a more important role, and takes up more and more of our time, than the creation of new things with that information. This is an ever-present dilemma. We continually dip into databases as a substitute for the very experience that is supposed to give computers their raw data. If we all did nothing but sit with our desktops, there would be no raw data. But I must be careful what I say. Perhaps medium is meaning in this age. It cannot be divorced from content. Whether I sit down with a book or a desktop may only be a matter of preference. The age of cyberspace is the age of multimedia, where experience is offered vicariously. Marshall McLuhan—the iconoclastic thinker, media sage, guru of the electronic age, a visionary, seer, oracle, prophet, call him what you will—is everywhere present in these modest musings. He forced us to think about how our culture itself got transformed by the new media technologies, to accept that culture is not some isolated entity we try to acquire, but subsumes all our activities. McLuhan’s theme is on the grandest scale: the effect of media on civilization. And his basic premise: the particular form or medium of communication (e.g. book or TV) generates its own space and determines how the content will be received or interpreted. It is its own language. Typography or graphics are not merely decorative, but add or enhance meaning. He goes on to provoke: "Our most impressive words and thoughts betray us by referring to the previously existent, not to the present". We do not merely dip into the electronic media or get onto the information superhighway, and then go back to our main business. The media is our business. It is how we participate in the life of the species, allowing us to be everywhere and nowhere. The very idea of place is transformed. Moreover, by the very act of observation and discussion, the media becomes political in nature, and in turn politicizes everything it touches. We live in the combined age of electronics and media, both fueled by more and more information. Susan Sontag looks at the whole question of culture itself: literary-artistic vs. scientific, and the associated ‘dissociation of sensibility’(T.S. Eliot) that had resulted over the years since the advent of science. To the specialist, culture has become a commodity, a mere consumer product he can indulge in to satisfy some craving he develops in his spare time, or just to relax. It is his way of taking time off from the real, serious task at hand that demands all his energies. ‘Culture’, though, has become serious business precisely because of its marriage to science & technology. Sontag goes further: "The basic unit of contemporary art is not the idea, but the analysis of and extension of sensations". And so you have a new sensibility—one in which all forms of endeavor (a painting, a mathematical proof, a piece of pop music, a film, a machine) are not only equally accessible, but have their own standards of beauty, style and taste. Our way of looking at things has itself undergone a sea change. Let’s get back to the cyber-machine, our cyber-friend. Technique and spectacle drive modern human affairs, and computers help that process along. The how-to culture begins to dominate our thoughts. But how-to for what purpose ? We reach for the Mouse and click the way we brush our teeth or get into a hot bath. Morning ablutions, one for the brain and one for the body, inside out. Just a daily habit. Managing characters and text and figures and tables becomes its own reward. We need our daily dose—until we get addicted, requiring larger and larger doses. Our sensibilities get transformed as some of our senses are enhanced, others subdued. Computers have enormous powers of memory and resources of space. But the whole thing can become just a game we play with a wonderful tool that handles vast amounts of data in a split second. We may become obsessed with precision, procedure, speed, protocol, capability—the how-to syndrome—thinking that this is all there is. But is it ? Is there any way out? What about the creative impulse, spontaneity, a heightening of the senses ? Shouldn’t the use of this marvelous tool be inspired from without? Cyberspace is transforming the very way we think, organize, play, create, govern, do business. The tool enslaves us in ways we may not be aware of, may not have even dreamt of. The computer beckons, gives us the illusion of participation, accomplishment; it makes us feel busy and productive. Never mind carpal tunnel syndrome, low back pain, spinal disorders, spondylitis, or any other cyber-disorder. Buying and using a computer is a concession to our need to be occupied, in case there is nothing else to do, or nothing we would rather be doing. The geniuses of hardware have so far managed to keep pace with the wizards of software; a feat in itself, since software reflects the fancies of countless individual users. Computers (which really means the CPU) are, along with their peripherals, part of the furniture of contemporary life, and stand as unobtrusively as a television set. But, as with TV, will we ever develop a casual take-it-or-leave-it attitude towards them ? Or will we become obsessed with and addicted to them ? Even I, a novice at this game, have become slightly jaded after only a few weeks of courtship. One thing I will say for them, as I mentioned at the beginning of this piece: they’re quiet (unless you go for the multimedia option), with soft clicks and hums and grinds to punctuate the monotony. Whereas a manual typewriter has become an antique, a noisy curiosity with no memory. The very idea of community has changed beyond recognition. Like typewriters, traditional communities have also acquired a certain antique charm. The cyber-community is linked by memory, storage and electricity, not by direct human contact. Computers supposedly put an end to commuting. We can withdraw into our own cyberspace, in small dark spaces deep in the bowels of our house, hunched in front of that ubiquitous screen with its ghostly fluorescent-but-seductive glow while all those computer-less or computer-illiterate suckers are caught in traffic jams. The color monitor can be warm, intimate and inviting. Like a nice bed you don’t want to get out of. Computers can create the illusion of never getting out of bed. They hold you in their electronic embrace, soothing you with their purrs, whirrs, whines, clicks, ticks, beeps, blips, hums. Sounds that pervade the electronic ecosystem. Sounds of an electronic ecology. Our cells become chips. We become extensions of a virtually infinite electronic network, feeding it bits and bytes which it gobbles up with great speed and appetite. In turn, its products, or more aptly, its data-handling capabilities fuel our insatiable appetite for information. The products are obviously man-made. Confusions soon arise between the real and the virtual universe. Fantasy may get the upper hand and create unheard-of fictions. Imagination gets a fillip. Multiple worlds suddenly become commonplace. Th irony is that the PC tries to emulate the traditional graphic arts by reproducing figures, icons and pictures from a readily accessible bank of data, giving the user colorful, flickering images that draw him deeper and deeper into its warm embrace, seducing him. And the Mouse literally puts the world a fingertip away as the tips of our fingers click away to call up window after window of drop-down menus and dialog boxes. Like the TV remote that surfs the myriad channels now on offer at the press of a button. The cyber-revolution has made computers user-friendly to an astonishing degree. Print on the one hand, electronic images (text included) on the other. Paper the medium for the former, the screen for the latter. Books, magazines, newspapers and pamphlets we can smell and feel. The screen we can only stare at, until we print hard copy. Color graphics on the Internet attract us, even engage us as we navigate hundreds of web sites that offer routine as well as esoteric information. Still, reading a good book was such a great joy until satellite television and the personal computer came along and made heavy inroads into my life, changing it perhaps forever, for better or worse. A full-scale cyberinvasion. We retaliate in vain. Resistance seems futile. We begin to access data the way we climb a mountain: because it is there. To be engaged with computers is to be engaged with information on a vast impersonal scale; to be engaged with a book is to commune with something on a personal scale, perhaps with another or even one’s own soul. A book establishes a unique private relationship with its reader, that has little to do with doing research, gaining information or forming public opinion. That is not its principal function, or main purpose. There are now audio and video books—listen and stare, if you want to ‘read’ while driving or don’t care to lug books around. And ‘virtual’ books, that mimic the look and feel and experience of conventional books, are now on the cards. No need to go to libraries, bookstores or catalogs; simply download text from an on-line data base and electronically (or virtually) produce a facsimile or, going one better, an authentic imitation you can browse or leaf through. So I find myself engaged in what I would call ‘active reading’: book or magazine in one hand, Mouse under the other, while I think of what to enter. I cannot read and absorb without also sitting at the creative interface of keyboard, mouse and screen. Serious reading, in quiet contemplation, suffers a big setback, and eventually falls prey. Still, hard copy is unlikely to ever become totally obsolete because of next generation technologies. The questions of copyright, privacy, portability, eyestrain remain. So these apparently incongruous technologies will find a way to coexist. And so we have some writers still pecking away at manual or electric typewriters, producing text directly on paper. They merely skip the screen phase, not overly concerned with text manipulation or formatting or storage space or memory or convenience of handling or anything else. For them the tool is not an end in itself, allowing textual wizardry, verbal acrobatics, graphic manipulations and screen gymnastics. Their faith and confidence in writing-without-too-much-revision is unshakable. The computer and its printer have their own charm and aesthetic, which are not invalidated by old-fashioned methods. What’s more, they are capable of many ways of looking at figures as diverse as 2-D text or 3-D designs and animations or business graphics. They make life easier if we want to come to terms with the surfeit or deluge of information, much of it apparently useless. The day isn’t far off when computers will be much like the clothes we wear, though their function is much more complicated. Pages of type are replaced by electronic word files (stacked in alphabetical order on hard drives or floppy disks) which can be corrupted or wiped out at any time by what the cyber-nerds call viruses. So the cyber-wizards have fought back with anti-virus programs. Electronic files are phantoms, here today, gone tomorrow, leaving no trace. Typed pages with changes made by hand, however, are forever preserved, unless they catch fire or are consumed by termites and silverfish. But all the electronic memory in the world cannot retain the memory of a lost file. And with e-mail you have to worry about being ‘flamed’, but worse, ‘attached’. PC’s obviously have their perils for the unsuspecting. You learn to respect its rules. You begin to understand the role of logic as opposed to intuition. And yet, the analogies with the human brain are undoubtedly there. Whither the information age ? No-one knows for sure: There could be a crash, a deluge, an apocalypse waiting just around the corner, or a few moments away. All the security codes and back-ups in the world won’t help us then. What if the cyberworld were to go out of control? Codes of binary bits ‘byte’ into our consciousness and at all our stored information on discs and drives until the whole system is overwhelmed, and comes crumbling down, crashes, leaving a heap of raw, undecipherable humanity. Then what do we do ? Can we reconstruct the whole edifice? We might just have to twirl those fancy boxes on their umbilical cords and have fun flinging them into the air, to be rid of them once and for all. Let future archaeologists unearth the remains in an age when human beings will have evolved to some higher state, or even backwards to some genteel world. After all, it’s all in the eye of the beholder. So it's back to Godel’s interpretation of the illusion of the passage of time. Yet, there is something universal, even magical about the electro-magnetic spectrum, in which electrons and all other energies and radiations travel at the speed of light to make powered computing devices possible. How can we wish that away ? It may be the only constant in our cosmos, the one thing that may allow communication with extraterrestrial beings. So we must keep on sending wired and wireless signals, keep communicating with each other (via phone, fax, e-mail, cellular & any other electronic means), keep storing and manipulating information, keep presenting our findings, and generally keep ourselves amused and entertained. And some day in the distant future, the ultimate epiphany may come to pass: the thrill and shock of actual contact with alien beings. An out-of-this-world experience, literally. Isn’t that the only way? We had the atomic age, the information age, and now, by extension, we have the cyberage. It is an aspect of man’s creative evolution. Therein lies perhaps our salvation. Maybe it’s part of the Gaiea principle, an adaptive development in intelligent life wherever the basic elements of matter are as we know them. These musings are just that. I don’t offer them in order to sound like some sort of savant trying to exhaust the subject, but to behold all things cyber with a childish sense of wonder and delight that we could ever reach this state. Who would have thought it possible even a generation ago, save perhaps Arthur C. Clarke? Information theory, of course, would have predicted it. Just as our entry into space and our knowledge of orbital mechanics would have predicted man’s landing on the moon. Cyberspace subsumes and extends the electronic cottage envisioned by information scientists a generation ago. It is in tune with the natural ecology of the planet, with each thing, or item, occupying a niche or space in which to grow and flourish. But more important, it is about creating new worlds, inhabiting them at will, and communicating them to other souls, like-minded or not. Private and public worlds merge to form a true democracy of information and ideas. The true all-pervasive Brahma if there ever was One. We unite even as we prefer to exist in separate worlds. That is the irony: the citizens of the cyberworld crave the independence this powerful tool gives them, yet they derive their sense of worth by sharing their own world with the world at large, communicating in a truly common idiom with global reach. 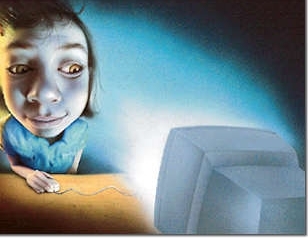 So, at first a reluctant cyber-convert, I’ve learned to take to cyberspace as a fish takes to water. I’ve unwittingly adopted a no-holds-barred stance, though I insist on seeking inspiration from without this tool. I allow the tool to grow on, and around me like a parasite, not vice versa. My journey through cyberspace and into the Third Millenium, with all its hopes, promises and prospects, begins on the right foot (or Mouse?). I look forward to the ride. A cyber-universe far more intricate than the physical universe awaits the eager inquisitor.